Maintenance contracts for turfgrass areas should be written to provide security for all parties involved. The person or company receiving services (the client) should know precisely what to expect, and the company providing the services (the contractor) should be aware of everything it has agreed to and therefore is required to do. This publication provides basic guidelines on how to write a good contract regarding turfgrass maintenance. A contract is an agreement between two parties in which each party promises to do something for the other. Usually one party promises to provide goods and/or services, and the other party promises monetary payment in exchange. A valid contract is binding on both parties and is legally enforceable. If either party fails to live up to the terms of the agreement, the other party can sue in a court of law to enforce the terms of the contract or, more commonly, to collect damages in compensation for the breach of contract. Usually a contract is written and signed by the two parties or their representatives. Sometimes an oral agreement can constitute a contract, in which case it would have the same legal consequences as if written. However, oral contracts are sometimes difficult to enforce. The advantage of a written contract is that there can be no dispute over the exact wording of the agreement. Contracts should be clear and simple. A contract should state the agreement between the parties as clearly and simply as possible. Plain, ordinary English is satisfactory, as long as it describes in sufficient detail exactly what each party promises to do. Fancy words or special legal terms are not necessary. Although a contract is enforceable by the courts, going to court is a costly and time-consuming process, best to be avoided. A well-written contract will reduce the chance of arguments or misunderstandings by stating in clear, specific terms what each party has agreed to do. If any portion of the contract is vague or unclear or can be interpreted differently by each of the parties, the contract should be rewritten to eliminate this ambiguity. If both parties understand at the very beginning of their relationship exactly what is expected of them, there is less chance of disagreement in the future. The location of the work (use drawings if helpful). A detailed description of the work to be done and the expectations of each party. Starting dates, frequency, and duration of the work. What equipment will be used. Who will pay for what, how much, and when. Definitions of any ambiguous terminology that may be interpreted differently by the two parties. A performance clause that specifies penalties for failure to complete the work in a timely or acceptable manner. Exclusions and limitations to cover such situations as vandalism, theft, and adverse natural conditions. Is the contractor expected or required to be licensed for all types of operations required by the contract, to obtain any permits, or to carry insurance (Workmen’s Compensation, liability for personal injury or property damage, etc.)? If so, the contract should so state. Is the contractor allowed to subcontract any work or assign it to others? If not, the contract should prohibit assignment of the agreement (or any portion) to others without the written permission of the client. Is the contractor expected to collect and dispose of the trash that the work generates? If so, how soon? Is the contractor expected to remove dead, diseased, or unsightly branches, vines, or other growth or to pick up litter and debris from the grounds? Are any practices that are fairly common in the trade prohibited? If so, the contract should specify them. If the contract calls for “weed-free” beds, for example, are chemicals permitted? If not, are all chemicals prohibited, or only certain ones? Is the contractor responsible for barricades, warning devices, or other precautions to protect people if the work is potentially hazardous? Is there any additional work that might arise? If the contractor is expected to provide any additional services without an additional fee, the contract should make this clear. What constitutes breach of contract, who will pay legal fees, and who will deal with work stoppage issues? What are the cancellation options? Be sure to include who may initiate cancellation and what the notification requirements are. Are there requirements from a homeowners’ association that must be met? Maintenance specifications are not quite the same as a contract. They are a description of the work to be done, but by themselves they are not a binding agreement. However, they can be incorporated into a contract as a part of the agreement. Maintenance specifications enable the client to specify the type and level of maintenance desired for the grounds. Such specifications are extremely important as a means of obtaining comparable bids if the job is to be awarded to an outside contractor. Without detailed written specifications, there will be no way to ascertain whether bids from different contractors are based on similar levels of service. Maintenance specifications are also useful in situations in which no contract is needed, such as when a company hires its own crew to maintain its grounds. These specifications can provide guidelines or instructions for the grounds maintenance crew, and they pro- mote continuity of service if there is a major change in personnel. Maintenance specifications can even be helpful in making management decisions. If the budget must be reduced, for example, a review of the specifications might suggest which items could be eliminated or reduced in frequency in order to save money. What to include in maintenance specifications. The same general principles that apply to writing contracts apply to writing maintenance specifications. The specifications should describe what is expected in clear, simple, yet specific terms. In developing maintenance specifications, begin by making a list of the broad areas of concern, such as turf, shrub beds, hedges, ground covers, flower beds, trees, mulched beds, pathways, sidewalks, and paved areas. Then for each of these general areas, make a list of the important components. For example, mowing, edging, trimming, fertilization, irrigation, thatch removal, aerification, re-seeding, and pest management would be listed under “turf.” Similarly, a list for “shrubs” might include fertilizing, pruning, mulching, and pest management. Finally, for each of these components, try to identify all critical factors (specific details that determine whether the job will be done properly), and include these details in the written specifications. Thus, with respect to mowing, specify not only how often the turf is to be mowed, but also address mowing height, clipping disposal, type of mower, and blade sharpness. To take another example, it is not enough to state that the turf will be fertilized four times a year. Specify the approximate dates, the type and analysis of fertilizer to be used, the rate at which it will be applied, how it will be applied (type of spreader to be used), and whether excess fertilizer applied to impervious surfaces will be swept or blown off the hardscape and onto the turf areas. Try to avoid statements that are vague, since they can lead to disputes. Stating that “flower beds will be kept free of weeds” and “hedges will be pruned as needed to keep them neat and attractive” sounds nice but can result in arguments later. How many weeds will be allowed? What is “neat and attractive”; how often is “as needed”? It is easy for people to disagree over such matters. In order to be more specific, try to find objective, measurable standards by which the performance can be judged. With respect to weeds, for example, describe how often the weeds will be pulled, and then state that all weeds over a certain size will be removed or that no more than a certain number of weeds will be allowed in a given area. With respect to hedges, describe how often the hedge will be sheared at various times of year, or state how much growth above the desired height will be permitted before pruning is again required. Maintenance specifications should be very precise and provide exact details about the work to be performed. They should also include information on every phase of maintenance, regardless of who is responsible for performing the work. It is suggested that North Carolina Cooperative Extension recommendations for turf and ornamental care be followed when writing specifications for landscape maintenance, so that maintenance practices will be based on sound information. This information can be obtained from the TurfFiles website. Figure 1 is a sample contract. For legal advice, consult an attorney. Figure 1. 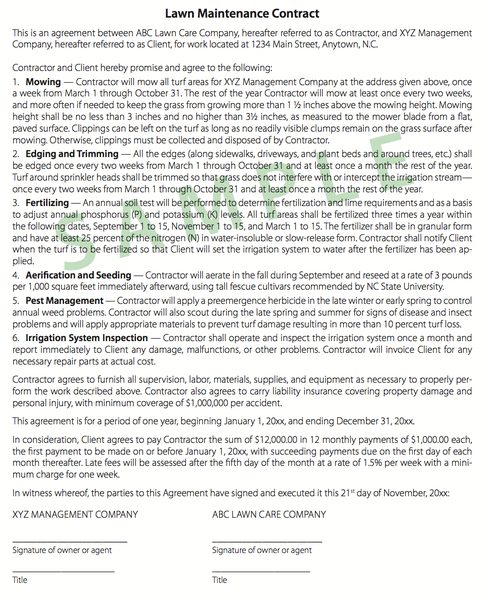 Sample lawn care contract.